Well, that's more like it! Last night's second workshop on the SR 55 Access Study, conducted by the OCTA and their consultants, LSA Associates, in the City Council chambers at City Hall, ran more smoothly than the first one on Monday. These workshops are designed to facilitate development of solutions to the growing volume of traffic through the Costa Mesa "downtown" area, which will soon strangle commerce and create major traffic issues on adjoining residential neighborhoods as frustrated drivers cut through seeking relief. While the auditorium setting was a little less user friendly for the 70 or so attendees (roughly half of Monday's contingent) - it was more difficult to meander around and see the exhibits, for example - the meeting had a little more much-needed structure. Instead of permitting speakers to jump up and speak randomly, as was the case on Monday, a "speaker card" system was used to permit orderly presentation of questions and suggestions. The result was a much smoother flow of both questions and answers. The tone of the meeting was more civil, too. In a refreshing display of candor, two speakers apologized to the moderators for their allegations Monday that traffic numbers they presented were bogus. Both speakers, among the most emotional on Monday, acknowledged that the consultant's numbers were accurate and the numbers they, the speakers, had been throwing around were way, way off the mark. And, last night there was no vitriolic criticism directed at the City Council. The array of questions from residents were thoughtful and relevant. For example, former Planning Commissioner and two-time city council candidate Bruce Garlich used part of his time at the microphone to suggest a modification to the apparently most popular choice - the so-called "cut and cover" option. He suggested that a "boring" alternative be investigated, citing the advantage of being less disruption to traffic and commerce in the Downtown area during construction. His suggestion was seconded by a subsequent speaker. It was good to see Bruce back in harness again, bringing his wisdom and insight to city affairs. This workshop was the final presentation in Costa Mesa. There remains one more workshop scheduled - at the Sea Scout base in Newport Beach on April 10th, 5-7 p.m. After that meeting representatives of LSA, the OCTA and Cal Trans will assess all the options, use the comments presented to promulgate others and distill those down to 3-4, from which a course of action may be chosen. It is hoped that once those final choices are prepared the residents and other stakeholders involved in this process will have a chance to hear about them before the responsible government entities make their final selection. Unclear is where the mountain of money necessary to fund any of the long-term options will come from. The current, funded and approved, plan to add one northbound lane on Newport Blvd. through the downtown area and one short southbound lane from 19th Street to Broadway will be constructed later this year. Other short-term solutions, such as signal synchronization, will be implemented in the relatively near future. For those of you interested in reading some relevant contemporary articles on this subject, you can follow these links. Byron de Arakal published two columns in the Daily Pilot the past two weeks. The first is entitled, "Don't count on 55 Relief". The second is, "55 outlook grim at OCTA forum". Between those two commentaries the Daily Pilot published an article entitled, "OCTA asks for 55 Freeway input". 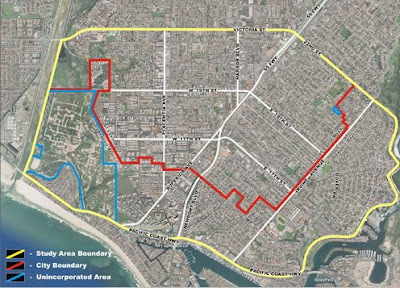 In addition, you can go to the OCTA website for more detail, including charts and descriptions of the several alternatives proposed at this time. Based on comments made by officials at the meeting last night, regardless which is selected, none of the longer-term solutions will begin for more than two decades. By then, most of the attendees will either be long-gone or will be residing is a care facility, concerned only about the traffic to and from the dining room. In the meantime, the recently-energized cadre of citizen-activists promise to pay close attention to this issue and provide guidance to our elected officials - whether they want it or not. That's good news for all of us.